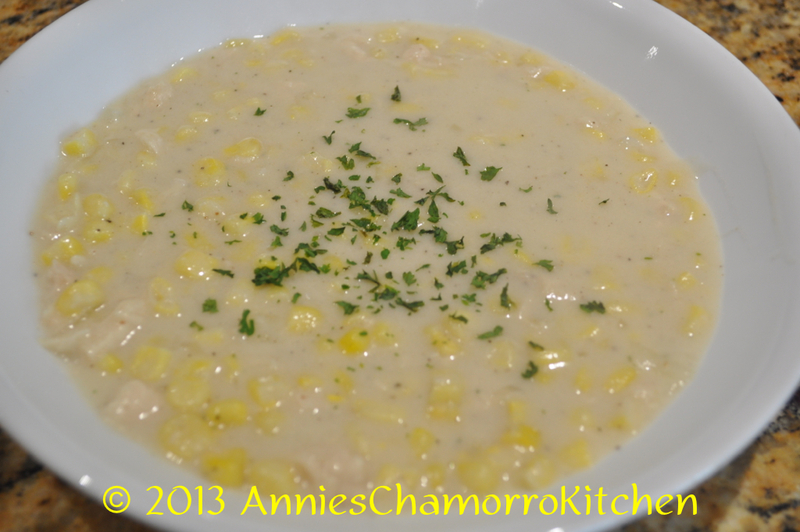 Chicken corn soup is a classic dish on Guam. It’s made many different ways, from cutting corn kernels off fresh ears of corn to using canned or frozen corn. As with most recipes nowadays, you can find fresh ingredients right in the freezer section of your grocery store–ingredients frozen right at the peak of ripeness so that we can enjoy them year round. 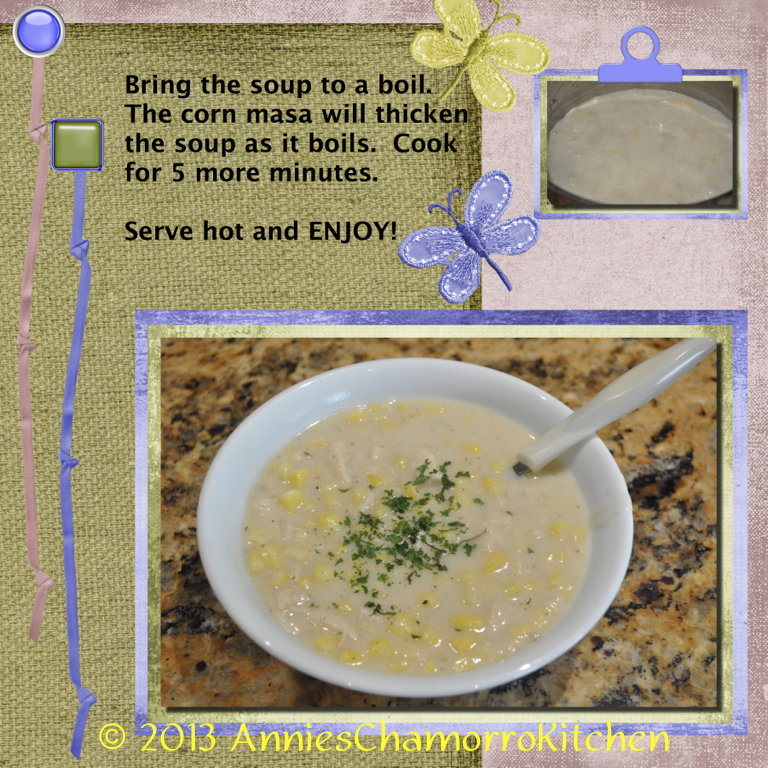 Cook a pot of my chicken corn soup. It’s perfect when you’re craving comfort food, or if you want something to warm up your insides on a cold, blustery day. Hi Annie, thank you for your recipes. I just wanted to know how much is a serving and how many can it feed? I might be serving a group of 50 adults & thinking of doing soup & salad & possibly 1 & 1/2 dozen devilled eggs, for dinner. Well, depending on how much you dish out, you could probably get 10-12 servings with this recipe. However, since it sounds as if this will be dinner, you may want to triple or even quadruple the recipe and serve larger portions. Hi Annie! 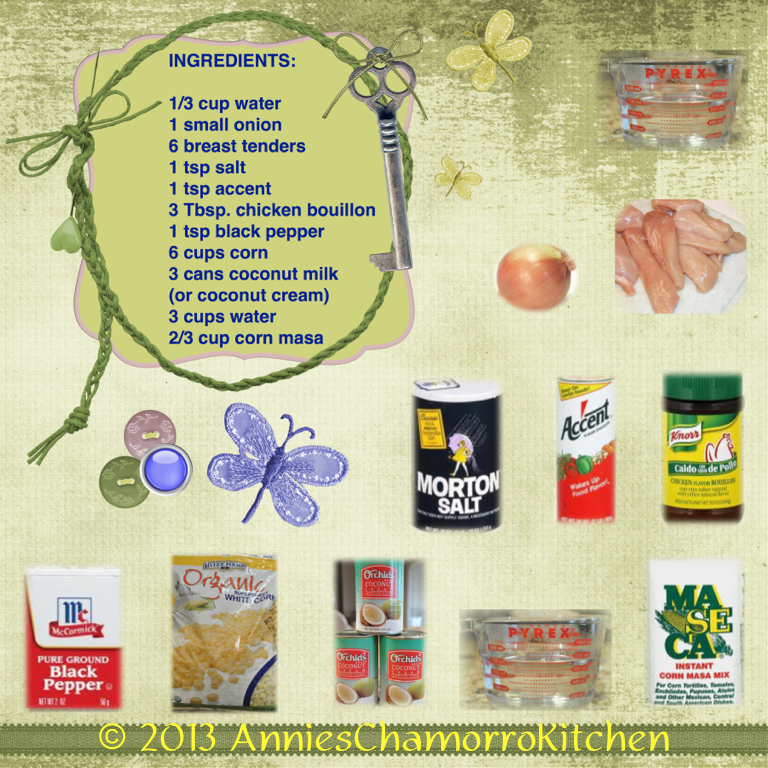 I would like to use the Extra large Knorr chicken bouillon cubes for your corn soup recipe. However, am not to sure how much I should use or can I even use that instead of the powdered chicken bouillon. Might you please advise as my preference is to use the Extra large Knorr chicken bouillon cubes. I don’t think I’ve ever used (or seen) “extra large” bouillon cubes, so I’m not sure how much you should use. Try using one cube then taste the soup to see if it needs more seasoning, adding more if it does. I always make great food with your recipes. It reminds me of being back home in Guam. Thanks, Shalimar! By chance, is your mom Lupe? 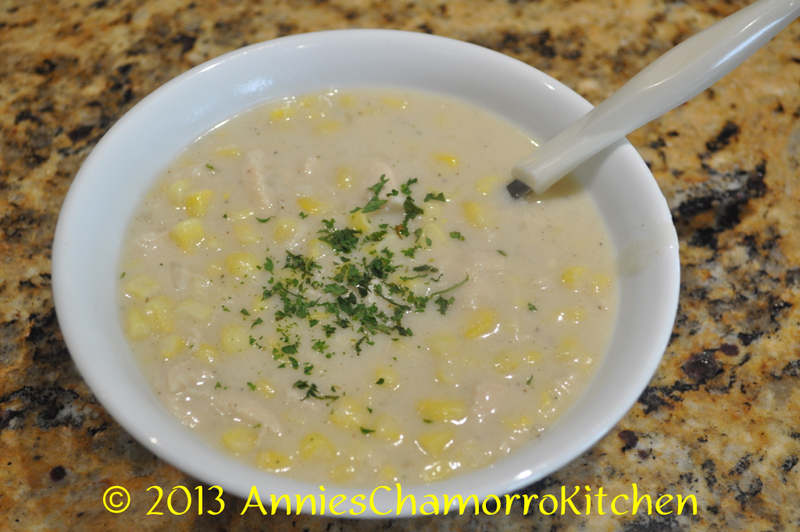 I made this corn soup without the chicken! I’ll have to remake it with the chicken. I made it for a friend and she absolutely loved it Even though I forgot the chicken. She said it reminded her of home. Hi Annie i Just Wanted To Say Thank You ! Corn starch is flavorless, while Masa harina adds a sort of nutty corn flavor. 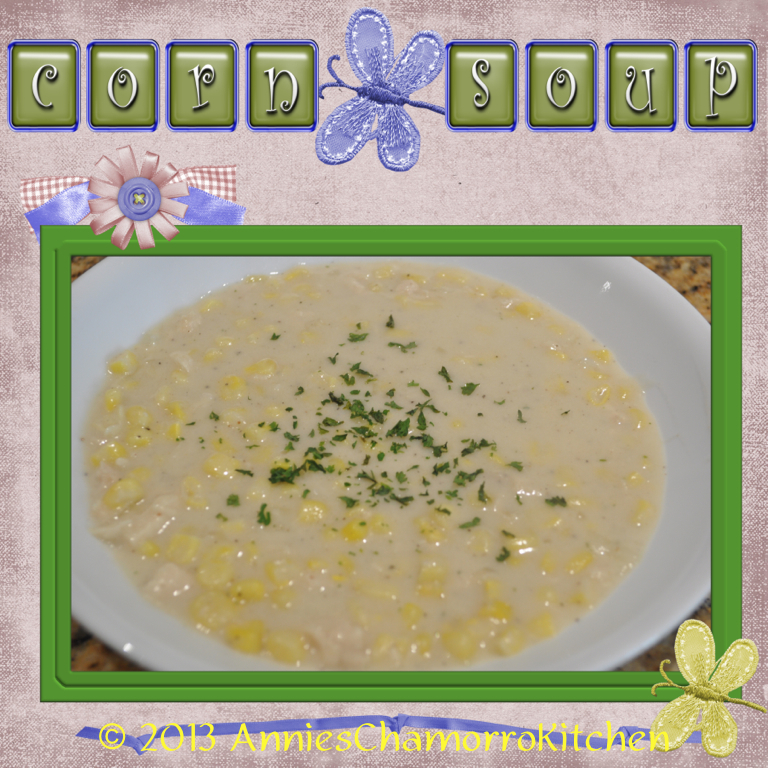 My husband had asked me to make corn soup for one of the Sunday potlucks that he has at work and when I found your recipie online I asked my daughtet if she could help me make it. It was so easy to make and it was delicious! I’ve tried using other recipes that I found online but yours was the best. Thank you Annie! When I was stationed in Guam, the ladies made corn soup but it had shrimp and crab and the base was thick but seemed slightly opaque is that a different recipe? You can certainly use crab meat and shrimp instead of chicken in this recipe. Sometimes the broth is thickened with flour, which will thicken the soup and turn it opaque. My grandma used to make this for me when I was a kid <3 I didn't get to learn it from her before she passed away; I'm so excited to try this recipe! It brings back a lot of good memories-thank you!!! I’m going to try making this Annie. It looks delicious. Yummy! I need that in Idaho too ! I have to say that this recipe is the most delicious I have EVER tried! Don’t get me wrong, there are good ones out there, but if you follow the recipe to the ‘T’, it comes out perfect! Just the right amount of salt content and coconut milk w/masa! 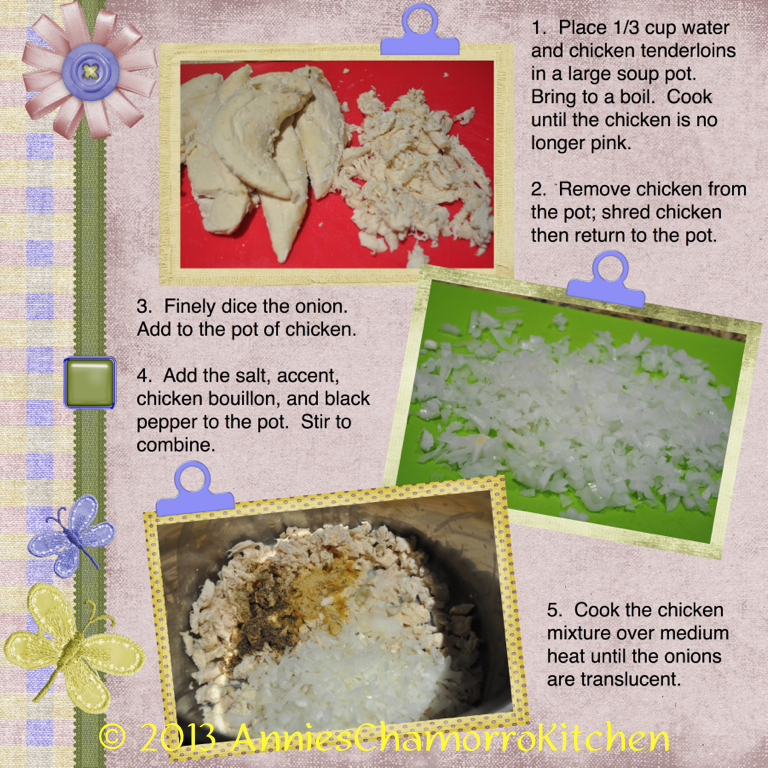 Thank you so much Annie for sharing this recipe! YUM! 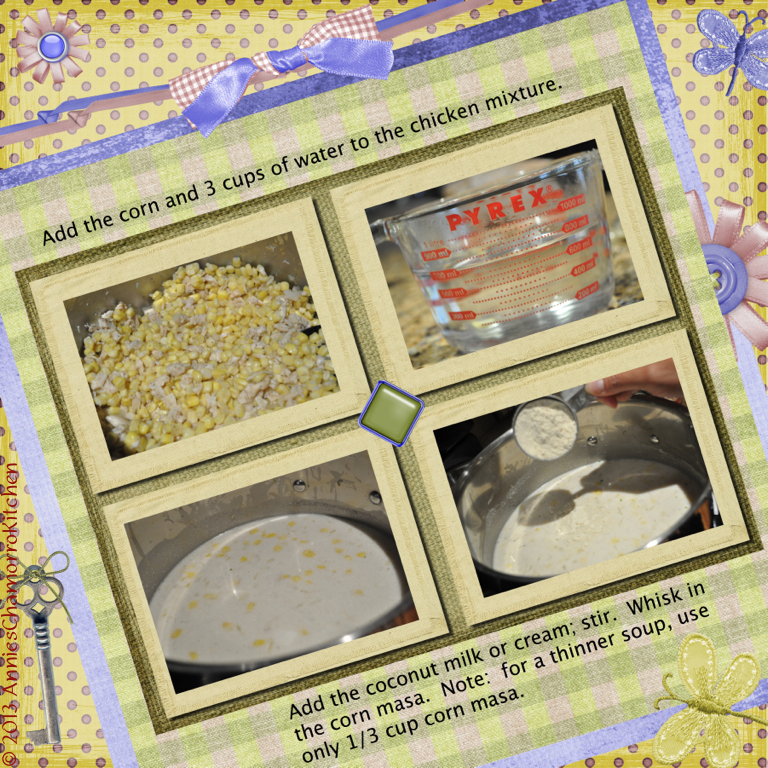 I’ve always made my corn soup using Masa Harina!